“Jack” Norris Torn to Pieces by a Flying Fragment of Iron. A sickening mass of living, quivering flesh, mangled beyond recognition, and scarcely a resemblance to humanity. Such was the sad end of poor Jack Norris. One of the best known saw mill men and engineers in the county and a man that everybody in northeastern Daviess County knew and respected. The accident that deprived him of life after fifty-two years residence in Daviess County, happened at twenty minutes after 9 o clock Thursday morning in Barr Township, ten miles northeast of this city. Norris operated a portable saw mill, and had been running his mill on the farm of Clay Doane, just north of Henry Sefrit’s place, and near the Harrisonville road, since last spring. The mill worked a force of four or five men when in operation, including Mr. Norris who was the engineer. His sawyer was his son, John Norris, Jr. The boiler and engine of the mill were purchased about three years ago, and had been used almost constantly from that time. The engine was about a 16-horse power. Thursday morning the men went to work as usual, the force consisting of “Jack” Norris, his sons, John and Elbert, Lewis McAtee, and Thomas Murphy. They were a little later starting than usual Thursday morning. Clay Doane, owner of the farm where the mill stood, was hauling wood that morning, and he and his team stood on the bank of a little creek or “branch” that runs near the mill. Shortly after nine o’clock Mr. Doane was startled by a terrific explosion, and for an instant the air about the mill was filled with the debris of the wrecked saw mill – boards, logs, splinters, pieces of iron, parts of the boiler, and coals of fire from the furnace. The most horrible flying object, however, was the dismembered and mangled body of a man, which was shot through the air and surrounding tree-tops for a distance of more than 100 yards. The body was that of Jack Norris. He had evidently been standing at the side of the boiler when it let go, and a section, weighing a thousand pounds, had carried him in its flight through space, tearing his head from his body and reducing his form to shapeless and bleeding mass in the twinkling of an eye. Hi body was split open, and from it, yet quivering with life, some of his internal organs were torn from their places and strewed along the terrible track of the heavy piece of boiler plate, which swept through the air with irresistible force, cutting limbs from trees 30 or 40 feet from the ground, and splattering their inanimate trunks with the brains and blood of the luckless engineer. Having exhausted its force, the mass of iron fell in the road 100 yards from where it started, and a few feet further on lay the lifeless remains of Norris, who was mangled beyond recognition. Bits of his flesh, hair, and beard were found sticking to the pieces of boiler. Death, of course, was instantaneous, and he was killed as suddenly as if he had been prostrated by a bolt of lightning. The other men who were working in the mill were all more or less injured. John Norris Jr., the sawyer, had an arm broken, but was not rendered unconscious. Elbert Norris, aged 18, Willis McAtee, aged 35, and Thomas Murphy were all prostrated by the force of the explosion, the breath knocked out of them, and each more or less seriously hurt. Elbert Norris’ hurts were of the most serious character and may yet prove fatal. He has a dangerous scalp wound, and was bruised about the body. Clay Doane was the only man about the mill who was not injured. He stood within 100 yards of the mill when the explosion occurred, and says the shock did not affect him, nor even frighten his team. All the occupants of the houses in the neighborhood, however, felt the shock. Mr. Doane was, of course, the first on the scene of the shocking accident, and he cared for the wounded as best he could till aid came. The body of the dead man was put in as presentable shape as possible under the circumstances, and conveyed to the deceased’s home, near St. Mary’s. The wounded men were also taken home, and their injuries attended to. Based on plat maps and the description given in the article I believe I was able to work out where the accident took place. 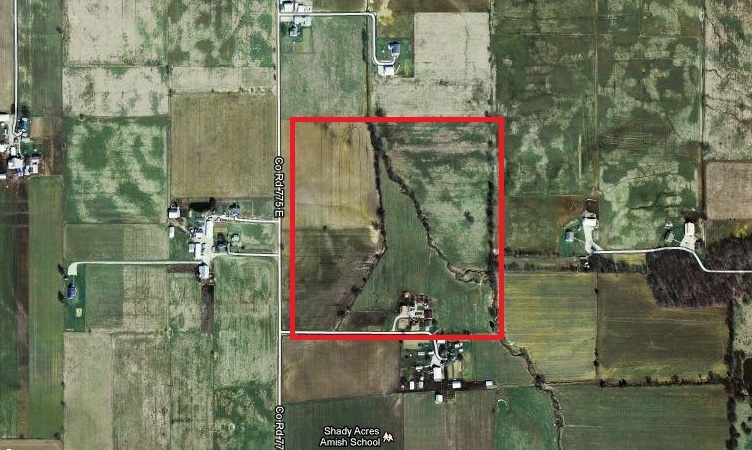 Just north of the Amish school (north of Cannelsburg) on County Road 775 East, south of County Road 400 North. I found this when I visited the Indiana State Library. I love 1.) that the writer is also the man who ministered the funeral service and 2.) how delightfully flowery the language is. Father Caywood was born in the State of Maryland in the year 1790. From there he removed to Kentucky, and thence to Indiana in 1833, where he resided until his death. In early life he made an open profession of his faith in Christ the Savior, and United with the Baptist Church. Previous to his leaving Kentucky he identified himself with the Christian church. On locating in Hendricks County in 1837 he took membership with the church at Brownsburg, where it remained until his death. In 1856 his beloved companion was taken from him by death, and the evening of his life was spent with his son in law, Mr. Ben McDonald, where he received every kindness and attention that love could bestow. He was the father of 13 children, 8 having preceded him to the spirit world. For several years, on account of bolidy infirmities, he had been prevented from meeting in the public worship, but his faith wavered not, though the “eye grew dim and the natural force abated.” His last illness was brief. Gently as the sun descends to his western home, he, on Nov. 3, 1884, closed his long period of service at the age of 94 years. He came to “his grave in full age, like as a shock of corn cometh in, in his season.” Services were conducted by the writer at the church at Brownsburg, after which his remains were laid to rest beside his wife, while the rainbow of immortality arches their graves. 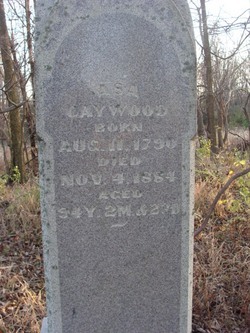 Asa Caywood's headstone in the middle of a stand of trees... in the middle of a corn field...in the middle of nowhere. 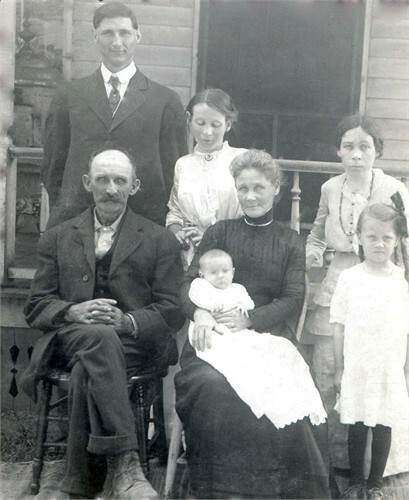 Asa Caywood (father of) > Leah (Caywood) Ward (mother of) > Margaret (Ward) Sparks (mother of) > Henrietta (Sparks) Boyce (mother of) > Dorothy (Boyce) Nelson (mother of) > Kevin Nelson (father of) > Andrew! Unfortunately while I’ve been on break I have only had one day where I was able to make it to the Indiana State Library. It was, however, a great visit. I learned a lot of interesting info. I was mostly looking for obituaries for Andrew’s family. The goal is to get as many copied and recorded with the information transferred into my tree as possible. It was amazing how helpful it was to fill some holes in my mom’s branch while out in Scranton. A 30 pound liver? My husband made the point that my dog is 30 pounds. Now, this is a newspaper from 1907 and accuracy was never a strong point of sensational journalism. But even a 20 pound liver would be amazingly impressive. The other thing I love about this article is that it was front page news! A surgery of one of the residents was front page news. Anyway, it is sad that he died of liver failure at a young age, but this was an interesting bit of history that I enjoyed reading. This is a photo that was THOUGHT to be Jacob Yazel. If anyone out there sees this and knows otherwise, please respond. I am guessing he is the one seated. He would be around the right age. Jacob Yazel is Andrew’s Great Great Great Grandfather in this way. Andrew Nelson, son of > Gloria Reed, daughter of > James Reed, son of > Edna Faye Seymour, daughter of > Maude Yazel, daughter of > Jacob Yazel! My mom died a year ago today. Needless to say, it’s been kind of a rough year. Throughout my genealogy research, one thing I have learned is that obituaries used to be much more personal and interesting to read. While attempting to put together my mom’s obituary a year ago, we made sure to get all the “important” stuff in there; but there were a lot of family names we had include, and not enough space to mention how unique of a person she really was. 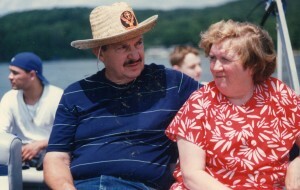 So for my post I would like to write a much more personal obituary for my mom. Linda Lee Kinsley Shaw Jennings Brown Kelley (as I used to call her when I was being a brat and she would refer to me as Erin Elizabeth) loved music. She used to ride around in her car with CDs that were especially made by her children with all of her favorites, dancing the Linda dance. This dance took on three different forms. There was a fist shake. There was the flat hand thrust. Then there was the combo of the two. She loved all kinds of music. She even loved disco. Every time some cheesy disco song would come on an oldies station she would remind us about how disco was a “real art form” and that she took disco lessons back in the 1970s, and so did A LOT of other people. She loved Motown. She obsessed over Michael Jackson’s live performances, especially when he was young. She hated John Mellencamp because he was “too country” but loved Kenny Rogers. She loved films, and therefore loved soundtracks. A year later and I still can’t listen to You Can’t Always Get What You Want by the Rolling Stones without bursting into tears (as The Big Chill was her favorite movie). 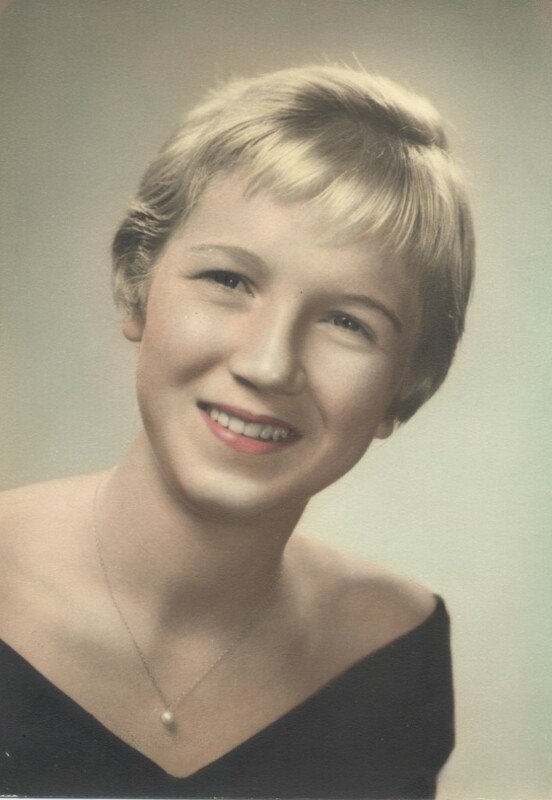 Linda Kelley in her senior portrait, abt. 1960. To my mom, everything was the best or the worst. It was always, “Wasn’t that the BEST cheeseburger you’ve ever had?” Yes, mother. I remember all cheeseburgers in my history and that one was THE best. “Isn’t this the worst winter EVER?” Yes. The worst. Ever. Linda had six children. She was their biggest fan and most vocal advocate, especially to each other. Within sibling relationships there will always be strife, but my mom was the peacemaker. She tried to make us realize that we are all so completely different. We shouldn’t try to change each other, but accept each other as they are. One thing I heard from my mom often was, “You’ve got to get over it. That is how _______ is. “ This was easier said than done, but I understand what she means. She finally got to do what she really wanted to when she started her company, which eventually became Healthcare Professionals. But she always worked, before and after Healthcare. I mean…she took vacations and whatnot. But I never remember my mother taking much of a break. She never really retired. When she “retired” she continued to work on her booth and work for Alliance Home Care. When she got sick she was so upset that she wasn’t working, and couldn’t wait to get back to it. She gave that work ethic to her kids. She always thought I was better than I was and tried to be a cheerleader for everything I was interested in doing. When I moved away from home she demanded a phone call every other day or so. If I didn’t call her, she would call me. If I didn’t return calls, I would get an earful and a guilt-trip. This usually wasn’t so hard for me, considering during my entire childhood my first move when I got home from school was to call my mom. It is still hard for me to pick up the phone after an interview or a really good movie and realize she isn’t the person to call anymore. She loved to travel, but refused to leave the country (“There’s just so much to see here! Why would I need to leave?”). She loved having a place to get away. They had what we called “the metal tent” at Lake Lemon for years. Her other favorite places to visit were Las Vegas (because she loved the nickel slots), French Lick, Indiana (a place we went as a family for years), and pretty much anywhere else with Fred. On a short weekend jaunt to Lake Lemon, (near Bloomington, IN) with the whole fam. She loved her husband, Fred. She took care of him and probably drove him insane. I can still hear her in my head screaming, “Frederick! Get In Here!” She nagged him, but I am convinced that he liked it. Linda was sick for years, but kept most of her health problems a secret from her children. She had a heart attack at 57. She had diabetes for years before she told us she had it. She had congestive heart failure for a long time before she told us she had it. Her kidneys were failing when she attended my wedding and never mentioned anything about it. While she cared for everyone else, she did not take care of herself. I never saw her eat a fresh vegetable or a piece of fruit…in my entire life. When she finally got outwardly sick, it was too late. My mom was in the hospital for a few weeks, and then in PT rehab a few weeks. Things were looking up when she was finally sent home to continue physical therapy from there. She seemed upbeat and happy. She had started dialysis, which she hated. The last time I talked to her we were making plans for me to take her to dialysis and then hang out and have dinner at her place. I never got to pick her up. She went to the first treatment of dialysis that week and had a heart attack as she was waiting. She never woke up again. I am at least grateful that our last conversation was a good one, and she was in good spirits. We didn’t bicker at all, which is mildly shocking. But I didn’t get to tell her I really did enjoy her, or tell her I liked seeing movies with her (even really bad ones), or that I always liked her spaghetti the best. Or goodbye. My mother was not a saint. There are things that she did in her life that I would not consider commendable. She was stubborn as anyone I have ever met in my life. 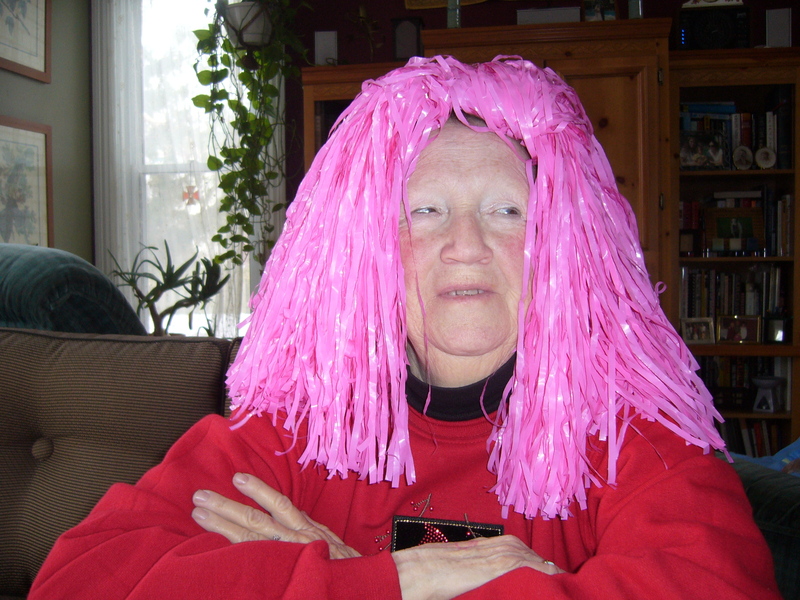 Sometimes when I talked about my mom the word “infuriating” would slip out….regularly. She was often close-minded about the weirdest things. “I could never date a bald man.” But she was nice. She was SO nice. Anyone who ever met her could never say otherwise. These are the things she should be remembered for. My mom, after letting her gradndaughter Remy work on her hair. I really miss her, more than these (or any) words can say. Groundhog Day! It’s A Dooooozy!